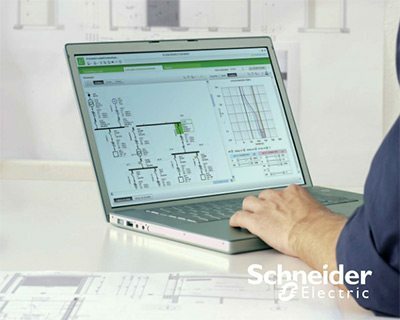 Ecodial is low voltage electrical installation design software developed by Schneider Electric. It actually calculates LV electrical networks and helps you to choose the right equipment and to optimize your electrical installation. Ecodial is free for download, you just have to register in order to receive licence key. Registration window will appear when you open up Ecodial, so just fulfill few simple information (name, email etc.) and you will receive licence key immdiately. 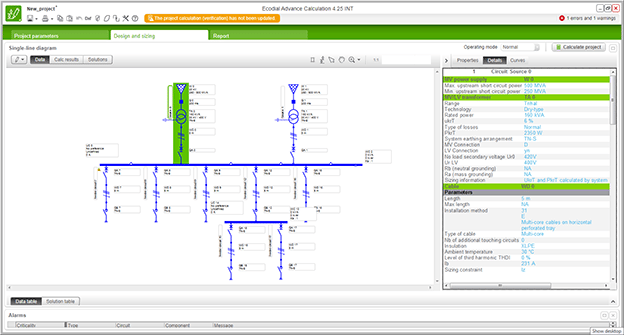 If you need a snapshot calculation Ecodial provides you with reliable results in a few clicks. If you need to easily find a product without entering into the Schneider Electric catalogue, Ecodial offers you a technically-oriented search engine for selection of a product, discrimination and cascading. What can you do with Ecodial? You select quickly and easily an LV network made with a single branch at three levels. You customise the few input parameters to meet your requirements. You let the power engine calculate for you in compliance with electrical standards. You visualise the discrimination limits of your protective device system by using versatile tripping-curve diagrams. This property determines the open/closed (off/on) position of circuit breakers and switches in the various operating modes. Ecodial can manage different status conditions of switchgear depending on the operating mode. This makes it possible to take into account installations supplied by multiple sources, those offering load shedding and those with seasonal operating modes, for example. When the status of a circuit breaker or switch is “closed“,, the circuit downstream of the circuit breaker (or switch) is supplied in the current operating mode. When the status of a circuit breaker or switch is “open“, the downstream circuit is not supplied in the current operating mode. When a part of the network is not supplied in a given operating mode, it is shown in blue in the single-line diagram. Given that the “closed” status condition is the most common in installations, only the “open” status condition is shown in the single-line diagram. I WANT information software for activation of ECODIAL 4.8. Tried to launch but get error that browser not supported, need IE 9+, however my IE is updated to latest version IE 11. Can someone help fix this issue. Tried uninstall and reinstall, tried different laptops, different versions, tried IE compatibility as well, don’t know what can fix this and there is no information either. Any help is appreciated, really need this software to work. THIS IS GOOD ELECTRICAL LV SYSTEM SOFTWARE. HOWEVER, SCHNEIDER SHOULD DEVELOP IT BETTER TO COMPETE WITH ETAP SOFTWARE AND LET IT ABLE TO BE USED TO SOLVE EVEN OTHER COMPLEX ELECTRICAL POWER SYSTEM STUDIES. I can’t register online, java script error pops-up during registration. What can be the issue? It’s installed on windows 7 x64 with ecodial 4.8. How can i do register ? When i open program It request register ? Have you fixed this problem?. I have the same issue with you. To slove this problem, try to update your internet explorer to the newest version! What can be the issue? It’s installed on windows 7 x64 virtual machine. Can you send to me the license key for that software to my email ? Agradecido por mantenernos actualizados con informacion del sector, lo cierto es que he tratado de utilizar el Ecodial 3.6, Realice el relevamiento de una pequeña industria que esta en funcionamiento, con las caracteristicas instaladas en la misma, sin embargo el Software me da una serie de errores, la aparamenta es diversa, por lo que asumo que se debe utilizar los productos de esta empresa para evitar estos errores. hi! i am trying to use ecodial as a help when designing new branches on an existing installation. My problem is that i am not able to set some parameters of the existing installation as cable or bar size. do you know if this is possible? You must register inside of Ecodial and you will get the key. Registration window will appear when you open up Ecodial, so just fulfill few simple information (name, email etc.) and you will receive licence key immediately. Consult. Electrical Engineer, Expert in Air Ports Equipments. You don’t need it from someone! Just register it with your email ID and they will send you for free! this softwere is very helpful for calculating fault current. i want to learn more about electricity because i have a passion for light and also am a professional trainee in schneider electric grenoble france. Can this software be used in designing the electrical wiring of Building. I have aleady download the version. 4.4 INT , but I got difficulties to get the licence key , can someone tell me how to do that ? , otherwise the program valid for only 30 days . Good day sir! can this software be used to observe what will happen to the system if we lower down the voltage in a tap changer a little bit? or basically its CONSERVATION VOLTAGE REDUCTION… or can you suggest me what software to use… i badly need it… i am a graduating student of ELECTRICAL ENGINEERING! The software version you use is obsolete. Registration is no more possible. Please use downstream link to get the up to date version. this is the message that you will receive when you are try to activate or register the software . I’ve downloaded the program, but I cannot operate and the program has asked me the password.Please, help me to know the password and activate the program. I can´t change the 50Hz frequency. How could i do that ? Could any tell me? Hello, I´ve just download ECOdial, i wana try it but i can´t change the 50Hz frequency. How could i do that?? Could any tell me? Thks for download.How to extend busbars. Contact you local Schneider Electric office to get it. helo.. why i cant download this software? it seems you not allowed sharing. help me.. Thanks Mr Edvard . It works . But it says the key code provided is for 3 months. After this period whether we need to pay to extend the time period ? Anybody can help to have Excel format for Soft Starter Sizing calculation. Please email me at allen_noynay@yahoo.com. Thanks in advance. Make sure you are logged in (and registered of course). Download link works fine. I don’t know what’s the problem but I can’t save or open any project. I need this. Thank you for your help.